Transportation:metro No.2 line, no.81, 82, 574, 581, 870, 871, 872 buses, tunnel line 3, 4, 5, 6. Admission Fee:Ticket to reach sightseeing hall on the 88th floor: 50 yuan for adult and 25 yuan for children. Evaluation: Jinmao tower is a building with both modern and traditional characteristic, which is a symbol and landmark of of Shanghai. Jinagmao tower is situated in the golden area of Lujiazui financial and trade zone in Pudong new district, which faces the famous Waitan on the other side of Huangpu river. Jingmaotower is invested, constructed and administered by Shanghai foreign trade center stock co. ltd and designed by Chicago som architecture office, usa. it&apos;s as high as 420.5 meters, which is the third highest in the world and the highest building in China. the tower covers an area of 23,000 square meters, with 3 stories underground, 88 stories above the ground and 6-story skirt-shaped rooms. the gross floor area reaches 290,000 square meters. 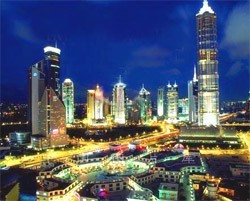 within the tower, there are office buildings, Jingmao kaiyue hotel and sightseeing hall. With the height of 340.1 meters and an area of 1,520 square meters, the 88th story sightseeing hall is the largest sightseeing hall in China at present. it is decorated luxuriously with the natural marbles and the marbles on the wall is only 3 millimeters thick. tourists may have a broad view of the grand metropolitan scenery alone the Huangpu River and the mouth of Yang through the glass curtain wall. the two lifts running at 9.1 meters a second may take tourists from the first floor underground to the 88th sightseeing hall in 45 seconds. there, you may appreciate the rosy dawn and sunset. An outdoor skywalk, which allows tourists to go out of the sightseeing hall on the 88th floor, has been open to tourists since July 28, 2016. Tourists can overlook the whole city of Shanghai on the 60-meter long and 1.2-meter wide skywalk. Safety helmets and ropes make tourists at no risk on the skywalk.